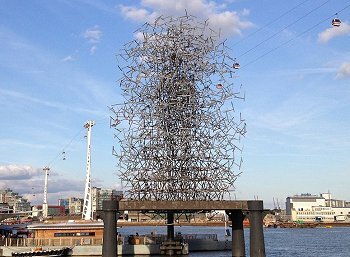 Buro Happold used LUSAS to assist with its design of the masts for th Millennium Dome (now renamed The O2) - the largest mast-supported, dome-shaped cable network of its type in the world. 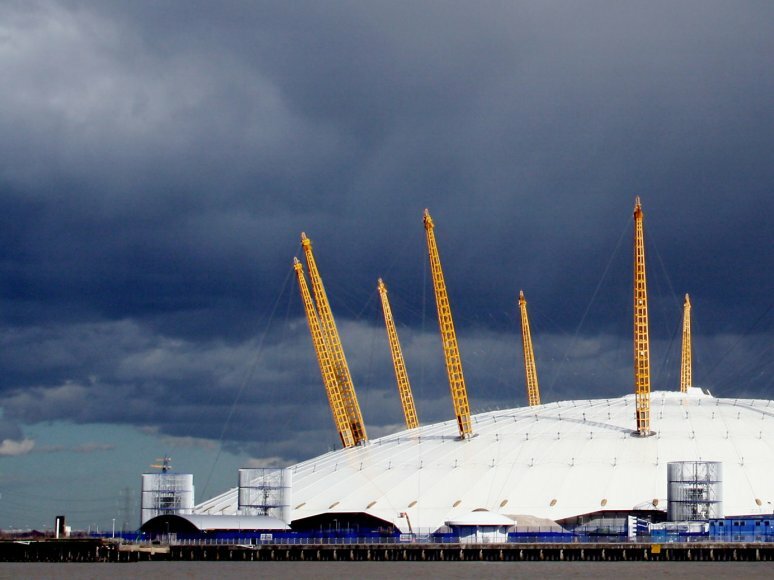 Located on the Greenwich Peninsula in South East London, the 'dome' was built to house a major exhibition that was open to the public throughout the year 2000. While all of the original internal exhibition and associated complex has long since been demolished, the canopy or shell of the dome still exists providing protection to the new entertainment development that has been constructed within it. The roof of the dome is a huge cable net, 320m in diameter and clad in 80,000m2 of tensioned PTFE coated glass fibre fabric. 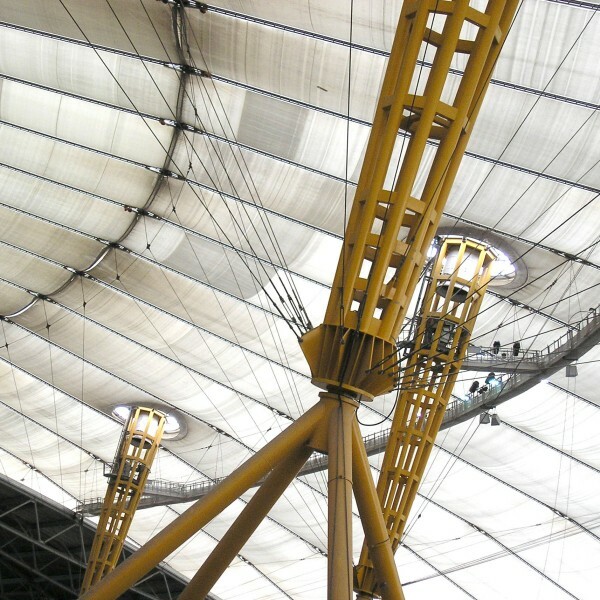 Twelve steel masts extend from the roof to support a tensioned net of steel cables, arranged radially on the surface of the dome and held in place by hangar and tie-down cables. Each mast is 90m long, octagonal in cross-section and weighs approximately 95 tonnes. Masts comprise longitudinal members of 323mm diameter circular hollow section and lateral members of 300mm x 200mm rectangular hollow section. After being manufactured in 6-16m lengths (where very fine tolerances were used to ensure that they would fit together correctly) the mast sections were transported and welded together on site prior to erection. Each mast is supported on its own tubular welded steel pyramid structure via a rubber pot bearing with a single locating bolt. As well as the length of mast components being restricted, the overall diameter of the masts was also limited by transporation requirements so a great deal of computer calculation went into verifying their load capacity. Buro Happold used a nonlinear analysis with LUSAS Civil & Structural to assist with the load capacity assessment of the masts. In addition, since the masts lean significantly, deflections under self weight and from icing loads also had to be taken into account. 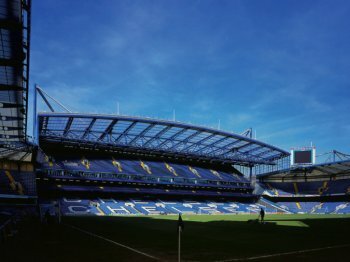 Initial out-of-straightness was also considered. 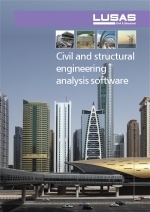 Reference to the use of LUSAS on this project: Paper entitled "The design and construction of the Millennium Dome" presented at the Institution of Structural Engineers on 22 April 1999 by Ian Liddell, Buro Happold and Peter Miller, Watson Steel Ltd.